A great week in Salt Lake City will conclude today with the free skates in junior ladies and pairs and the novice free dance. A hybrid of competitions in Salt Lake City included the debut of Meryl Davis and Charlie White’s Olympic season programs in the 2013 U.S. International Classic. Meanwhile, several novice- and junior-level athletes who compete in U.S. qualifying events got the opportunity to attend an early season competition with an international feel. Heading into the junior ladies free skate, Tyler Pierce is poised for the victory. She totaled 57.16 points for a strong short program and holds a six-point lead over Amber Glenn. Olivia Oltmanns set the pace in the junior pairs event, while Madison Fox and Val Katsman have a 10-point lead after performing the Argentine tango pattern dance. U.S. silver medalist Gracie Gold will continue her Olympic campaign today as the ladies take the ice for their free skate at the 2013 U.S. International Figure Skating Classic. Also set to compete today are 2010 Olympic silver medalists Meryl Davis and Charlie White, who will finish their first competition since wrapping up a perfect 2012-13 season with a second World Championships title. The ice dancers will take the ice for their free dance following the conclusion of the ladies free skate. Ladies free skate – 4:50 p.m.
Free dance – 7:45 p.m. The ladies of Team USA are poised to sweep the podium this afternoon with Gold sitting in first, two-time reigning U.S. bronze medalist Agnes Zawadzki in second and 2013 U.S. pewter medalist Courtney Hicks rounding out the podium. Teammate Samantha Cesario, who placed fourth at the 2013 World Junior Championships, is in fifth place. Davis and White are set to debut their Olympic season free dance with a comfortable lead of more than 10 points. In second place, five-time Canadian medalists Kaitlyn Weaver and Andrew Poje have a distanced themselves by nearly eight points from third place, which is currently held by their teammates, Nicole Orford and Thomas Williams. The rest of Team USA, comprised of Lynn Kriengkrairut and Logan Giulietti-Schmitt, Anastasia Cannuscio and Colin McManus and Alissandra Aronow and Collin Brubaker, sit in sixth, eighth and 13th place, respectively. Recaps of yesterday’s events, including the short dance and ladies short program competitions, the U.S. men’s podium sweep and the pairs free skate, are available free on icenetwork. 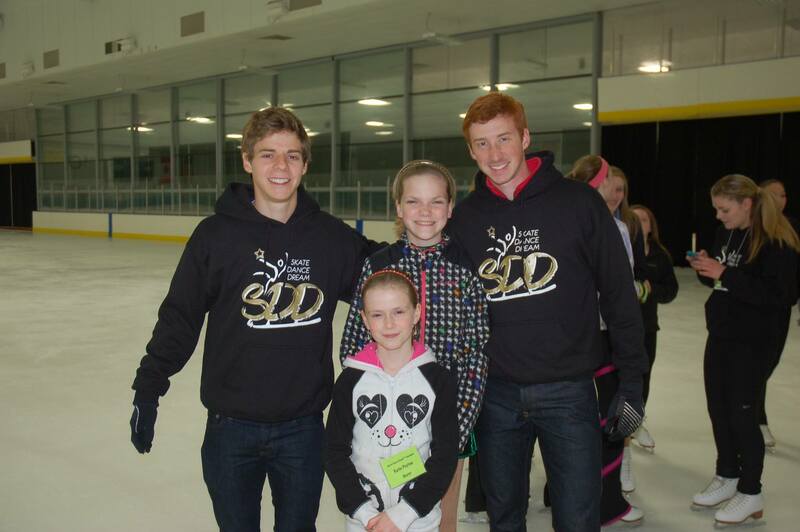 Competition also continues today for the 2013 Challenge Skate, an invitational for American skaters who have competed domestically at the intermediate, novice and junior levels. The event will begin at 8:30 a.m. MDT with the novice pattern dance, followed by the junior ladies short program at 9:09 a.m. and the junior pairs short program at 10:57 a.m.
Head to icenetwork for complete event coverage, live and on-demand competition video to Season Pass subscribers (results, news, photos and more is available free to all users), and don’t forget to follow us on Facebook and Twitter for live updates and behind-the-scenes photos throughout the day. Meryl Davis and Charlie White will begin their quest for Olympic gold today from the 2013 U.S. International Figure Skating Classic. After the short dance and ladies short program, we will see the free skate finals for the men’s and pairs events. Team USA is in prime medal contention in both events. Short dance – 2:35 p.m.
Ladies short program – 5:10 p.m.
Pairs free skate – 7:45 p.m.
Men’s free skate – 9:15 p.m. Joining Davis and White in the dance event are international threats Kaitlyn Weaver and Andrew Poje, six-time Canadian medalists. Americans Lynn Kriengkrairut and Logan Giulietti-Schmitt, who won bronze at this event last year, and Anastasia Cannuscio and Colin McManus both make return trips to the U.S. International Classic. Relative newcomers Alissandra Aronow and Collin Brubaker received the late invite to the event after Maia Shibutani and Alex Shibutani withdrew earlier this week. Also returning for a second year, and both in defense of their medal-winning finishes, are Agnes Zawadzki and Gracie Gold. They were 1-2 here last year and then flip-flopped to finish 2-3 at the 2013 U.S. Championships in January. Meanwhile, Samantha Cesario and Courtney Hicks will make their senior international debuts. In the pairs event, Kirsten Moore-Towers and Dylan Moscovitch of Canada have a six-point cushion going into the free skate. They are the reigning gold medalists at this event. Marissa Castelli and Simon Shnapir began their U.S. title defense and, despite one bobble on the side-by-side jumps, turned in a strong Carlos Santana short program for 62.26 points. 2012 U.S. champions Caydee Denney and John Coughlin, returned to competition for the first time since Coughlin underwent surgery last December, and are in a close third place. Max Aaron, the 2013 U.S. champion, turned in a strong Latin-inspired short program and has a nice lead with 81.49 points. His teammates round out the top four in the following order: Stephen Carriere, Joshua Farris and Grant Hochstein. Competition also continues today for the 2013 Challenge Skate, an invitational for American skaters who have competed domestically at the intermediate, novice and junior levels. The event will begin at 7:55 a.m. MDT with the novice men’s free skate, followed by the novice ladies free skate at 9:10 a.m. and the novice pairs free skate at 10:40 a.m. The race for gold is close in all three disciplines. Rebecca Peng (ladies), Eric Sjoberg (men’s) and Joy Weinberg and Michael Lueck (pairs) are in first going into the free skates. Icenetwork is the place for complete event coverage, including live and on-demand competition video to Season Pass subscribers. Results, news, photos and more is available free to all users. Official practice at the 2013 U.S. International Classic begins Wednesday, Sept. 11, with the pairs and men’s, while short programs in those respective disciplines take the ice Thursday evening for the short program. All four disciplines will compete Friday with the ladies short and short dance and the conclusion of the men’s and pairs events. Team USA features Meryl Davis and Charlie White, five-time reigning U.S. champions, two-time World ice dance champs and 2010 Olympic silver medalists. Also set to represent Team USA in Salt Lake City are Max Aaron, Gracie Gold, Marissa Castelli and Simon Shnapir and other U.S. medalists. The international field features two-time Canadian pairs medalists Kirsten Moore-Towers and Dylan Moscovitch and six-time Canadian ice dance medalists Kaitlyn Weaver and Andrew Poje. Icenetwork will provide complete event coverage, including live and on-demand event video to Season Pass subscribers. Results, news, photos and more will be available free to all users. Pairs Short – 8:50 p.m.
Men’s Short – 10:15 p.m.
Ladies Short – 5:10 p.m.
Pairs Free – 7:45 p.m.
Men’s Free – 9:15 p.m.
Ladies Free – 4:50 p.m.